1. One hour before cooking, remove the roast from the refrigerator, pat dry with paper towels; rub the roast with the olive oil, Kosher salt and black pepper and bring to room temperature for the hour. 3. Heat a roasting pan on the cook top on medium high for 1 minute, than add the roast. 4. Sear the meat on all sides for approximately 10 to 12 minutes. Remove the meat from the pan, place a rack in the pan and lay the meat on the rack. 5. Lower the oven temperature to 275 degrees and place the roasting pan on the top shelf of the oven. The lower roasting temperature should help to ensure even cooking throughout the roast. 6. Roast the tenderloin for approximately 40 to 50 minutes, checking the internal temperature after 30 minutes with a digital instant-read meat thermometer. Keep checking every 5 minutes or so, until the internal temperature of the meat reaches 120 degrees. The total roasting time will vary depending upon the thickness of the roast, as well as for how long it has been seared. 7. Once the internal temperature reaches 120 degrees, remove the roast from the oven and keep warm by loosely covering it with aluminum foil. The roast will continue to cook internally as the juices settle. For RARE let sit for about 5 to 8 minutes until the internal temperature reaches 125 degrees. After sitting for 15 minutes, the internal temperature will probably rise to 130 to 135 degrees – perfect for MEDIUM RARE. 8. 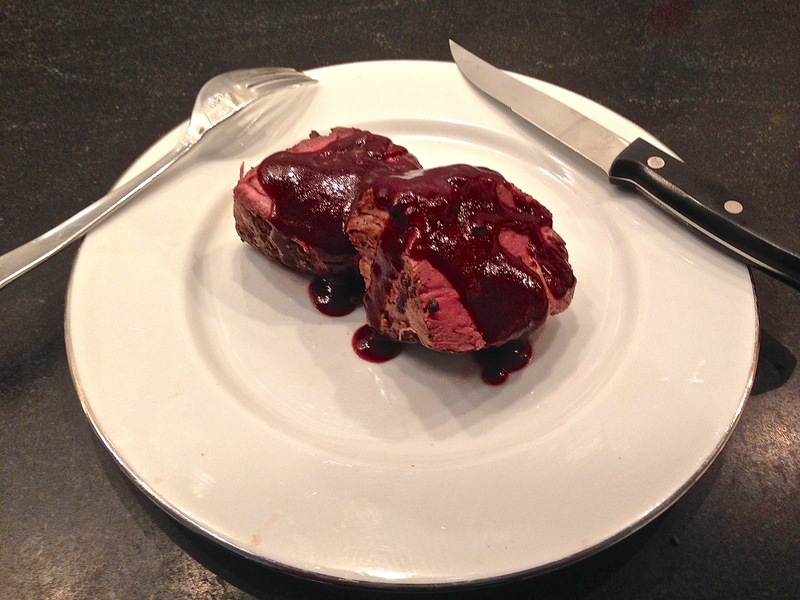 While the roast is sitting, re-heat the Port Wine Reduction Sauce on a low flame. Slice the roast into one-inch thick pieces, cut and remove the strings and pour the sauce over the sliced beef, or alternatively, serve the meat on a platter and serve the sauce in a gravy boat on the side. Serve immediately. 1. Melt 2 tablespoons of the butter in a 1 quart pot, on medium-low heat. 2. Add the shallots and slowly cook until translucent, about 5 minutes. 3. Add the thyme and bay leaf, stir well. 4. Add the port, bring to a boil, reduce heat and simmer for 20 to 30 minutes until reduced by ½. 5. With a fine sieve, strain out all of the solids, wash the pot and return the strained Port to the pot (there should be about 12 or 13 oz.) and re-heat on low. 6. Add the Demi-Glace and whisk until well blended. 7. Add the pepper and set aside until ready to serve. The sauce should be thick enough to coat the back of a spoon; if not, mix a tablespoon of cornstarch with 1/4 cup of cold water until in turns into a paste. Slowly whisk paste to the hot sauce until it is thickened to your satisfaction. 8. Just before serving, re-heat the sauce and add the remaining tablespoon of butter, stir well to finish the sauce. NOTE: Sauce can be made several days in advance (steps 1-7) and refrigerated. Heat well before serving and finish with step 8. 1. In a non-stick sauté pan, melt the butter on high heat. 2. When the butter is melted and bubbling, add the shallots and cook until translucent. 3. Add the haricot vert and sauté on high heat for 6-8 minutes, continuously tossing them with tongs. They will turn a bright green color when cooked.